In the Understanding the DOM series, we have discussed the DOM tree and how to access, traverse, add and remove, and modify nodes and elements using the Developer Tools Console. Although at this point we can now make almost any change we want to the DOM, from a user perspective it is not very helpful because we have only manually triggered changes. By learning about events, we will understand how to tie everything together to make interactive websites. In this article, we will go over event handlers, event listeners, and event objects. We'll also go over three different ways to write code to handle events, and a few of the most common events. By learning about events, you'll be able to make a more interactive web experience for end users. When a user clicks a button or presses a key, an event is fired. These are called a click event or a keypress event, respectively. An event listener attaches a responsive interface to an element, which allows that particular element to wait and "listen" for the given event to fire. We will go over all three methods to ensure that you are familiar with each way an event can be triggered, then discuss the pros and cons of each method. 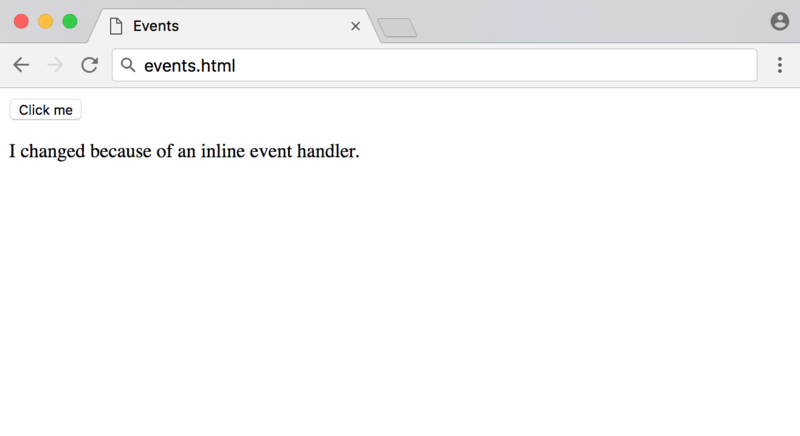 To begin learning about event handlers, we'll first consider the inline event handler. Let's start with a very basic example that consists of a button element and a p element. We want the user to click the button to change the text content of the p.
Directly on the button, we will add an attribute called onclick. The attribute value will be a function we create called changeText(). Let's create our events.js file, which we placed in the js/ directory here. Within it, we will create the changeText() function, which will modify the textContent of the p element. Inline event handlers are a straightforward way to begin understanding events, but they generally should not be used beyond testing and educational purposes. Note that when passing a function reference to the onclick property, we do not include parentheses, as we are not invoking the function in that moment, but only passing a reference to it. The event handler property is slightly more maintainable than the inline handler, but it still suffers from some of the same hurdles. For example, trying to set multiple, separate onclick properties will cause all but the last one to be overwritten, as demonstrated below. In the above example, the button click would only display an alert, and not change the p text, since the alert() code was the last one added to the property. With an understanding of both inline event handlers and event handler properties, let's move onto event listeners. addEventListener() takes two mandatory parameters — the event it is to be listening for, and the listener callback function. The HTML for our event listener will be the same as the previous example. We will still be using the same changeText() function as before. We'll attach the addEventListener() method to the button. Notice that with the first two methods, a click event was referred to as onclick, but with event listeners it is referred to as click. Every event listener drops the on from the word. In the next section, we will look at more examples of other types of events. At first look, event listeners seem very similar to event handler properties, but they have a few advantages. We can set multiple event listeners on the same element, as demonstrated in the example below. In this example, both events will fire, providing the user with both an alert and modified text once clicking out of the alert. Often, anonymous functions will be used instead of a function reference on an event listener. Anonymous functions are functions that are not named. It is also possible to use the removeEventListener() function to remove one or all events from an element. Furthermore, you can use addEventListener() on the document and window object. Mouse events are among the most frequently used events. They refer to events that involve clicking buttons on the mouse or hovering and moving the mouse pointer. These events also correspond to the equivalent action on a touch device. A click is a compound event that is comprised of combined mousedown and mouseup events, which fire when the mouse button is pressed down or lifted, respectively. Using mouseenter and mouseleave in tandem recreates a hover effect that lasts as long as a mouse pointer is on the element. Form events are actions that pertain to forms, such as input elements being selected or unselected, and forms being submitted. Focus is achieved when an element is selected, for example, through a mouse click or navigating to it via the TAB key. Keyboard events are used for handling keyboard actions, such as pressing a key, lifting a key, and holding down a key. Although they look similar, keydown and keypress events do not access all the exact same keys. While keydown will acknowledge every key that is pressed, keypress will omit keys that do not produce a character, such as SHIFT, ALT, or DELETE. Keyboard events have specific properties for accessing individual keys. If a parameter, known as an event object, is passed through to the event listener, we can access more information about the action that took place. Three properties that pertain to keyboard objects include keyCode, key, and code. Once we press ENTER on the Console, we can now press a key on the keyboard, in this example, we'll press a. The keyCode property is a number that pertains to the key that has been pressed. The key property is the name of the character, which can change — for example, pressing a with SHIFT would result in a key of A. The code property represents the physical key on the keyboard. Note that keyCode is in the process of being deprecated and it is preferable to use code in new projects. To learn more, you can view the complete list of events on the Mozilla Developer Network. The Event object consists of properties and methods that all events can access. In addition to the generic Event object, each type of event has its own extensions, such as KeyboardEvent and MouseEvent. The Event object is passed through a listener function as a parameter. It is usually written as event or e. We can access the code property of the keydown event to replicate the keyboard controls of a PC game. 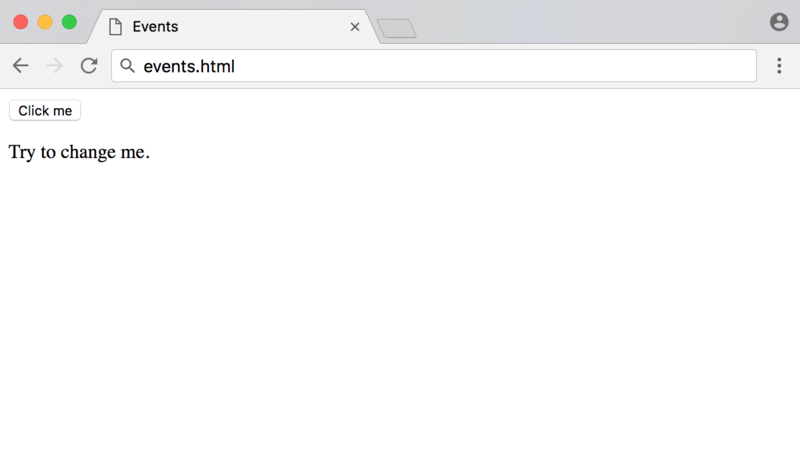 To try it out, create a basic HTML file with <p> tags and load it into a browser. From here, you can continue to develop how the browser will respond and to the user pressing those keys, and can create a more dynamic website. Next, we'll go over one of the most frequently used event properties: the target property. In the following example, we have three div elements inside one section. Clicking on any one of those elements will return output of the relevant specific element to the Console using event.target. This is extremely useful, as it allows you to place only one event listener that can be used to access many nested elements. 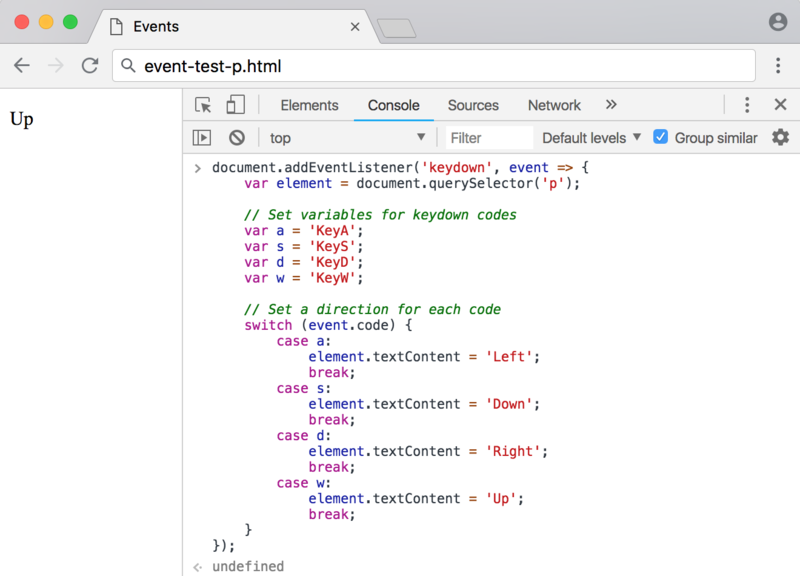 With the Event object, we can set up responses related to all events, including generic events and more specific extensions. In this tutorial, we learned what events are, examples of common events, the difference between event handlers and event listeners, and how to access the Event object. Using this knowledge, you will be able to begin making dynamic websites and applications.